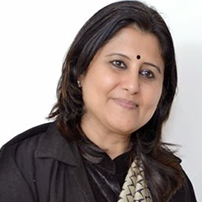 Ms. Anuradha Govind is the recipient of Sarla chopra memorial NATIONAL AWARD for invaluable and path breaking contribution for the promotion of Education, Social Welfare, Art & Culture, International School Award by British Council for innovative curriculum attributing the global dimension in education. During her tenure as Principal, the Srijan School got acclaimed as one the best schools of North Delhi by Hindustan Times C-Fore Survey. She is a prolific thinker, practitioner, a dynamic researcher and path-breaking educationist in the field of multi-dimensional & child-centered curriculum designing, innovative teaching methods, experiential learning strategies and a transformational trainer for teacher development, self- empowerment, leadership skills and team building. She has been regularly writing articles for Newspapers and magazines.